I sculpted this little guy eons ago, long before my hobby involvement. Back then my 'thing' was carousel horses. I love the creativity, spirit, and all the fun colors He's been sitting in my closet, never cast, after I lost interest in carousel horses. It's a shame to never cast him, since I had already put a ton of time into him. Obviously he isn't as anatomy oriented as the Model Horse Hobby requires, but I think he's fun as an art piece. 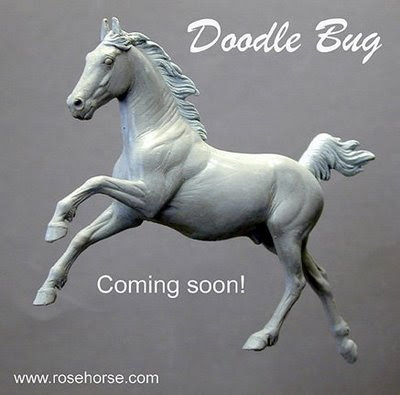 I would refine him more, of course, but he would mostly be a 'fun' horse, not meant to be shown as a model. He's classic scale (pretty close)What do you all think? Would anyone want a copy if I did a small resin run? Whoops, where did the time go? Seems like eons since my last blog post. We have about an inch of snow, with more coming. This area generally doesn't get substantial snow until after the first of the year, when we get smoothered in the stuff. Fingers crossed it isn't as bad as last seasons 4 1/2 feet.